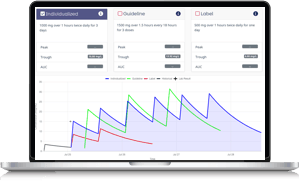 The DoseMe App is a dose-individualisation software application. It is intended as an aid for suitably-qualified medical staff in making dosing recommendations. The DoseMe App itself does not provide medical advice. By accessing the DoseMe App you acknowledge and agree to be bound by these terms and conditions. If using the DoseMe App on behalf of a corporation you warrant that you are authorised to agree to these terms on behalf of that corporation. By accessing the DoseMe App you warrant that you are a suitably-qualified healthcare professional, and that both your and any use of DoseMe for its intended purposes is legal in your local jurisdiction. DoseMe Pty Ltd grants you a non-exclusive licence to use the DoseMe App for the limited purposes of evaluation only, and any other purposes previously granted by written contract with DoseMe Pty Ltd.
DoseMe Pty Ltd retains ownership of all intellectual property rights in the DoseMe App, including any future development or modifications to the App, including any modifications incorporating data or user feedback. You must not copy, disclose, distribute, reverse-engineer or sub-license any part of the DoseMe App, nor use it for any purpose other than evaluation. Confidential Information means all confidential information belonging to DoseMe Pty Ltd, including the content and methodology of the DoseMe App, but excluding information independently known to you or in the public domain other than in breach of an obligation of confidentiality. You must not use or disclose any confidential information. You must keep your user id and password confidential. You are responsible for the actions of anyone who accesses the DoseMe App using your user id and password. You acknowledge and agree that DoseMe Pty Ltd may use de-identified data gathered via the DoseMe App and your user feedback, to make changes to future versions of the DoseMe App. any loss or damage to persons or property belonging to us or anyone else, caused by your usage of the DoseMe App. You expressly acknowledge and agree that to the maximum extent permissible at law, we are not liable for any losses, costs, expenses or damages however caused. You expressly acknowledge and agree that we are not liable for any indirect, special, economic or consequential loss or damage or loss of revenue, profits, goodwill, bargain or opportunities you suffer in any way, even if we knew or should have known about the possibility of such loss. You agree that under no circumstances will our total liability to you exceed $1000. DoseMe® is a registered trademark of DoseMe Pty Ltd. Any other trademarks are the property of their respective owners.